Makar Sankranti, also known as Sankranti or Makara Sankrant, is one of the highly auspicious days in a Hindu calendar and the day is dedicated to the worship of Lord Surya (Sun God). Makar Sankranti 2019 date is January 15. Punyakaal or time for puja and to take holy bath is from 7:22 AM to 12:01 PM on January 15, 2019. Makar Sankranti is the day when the sun enters into the zodiac Capricorn or Makara. It is also known as Uttarayana Punyakalam and heralds the arrival of spring season. In 2019, Makar Sankranti marks the beginning of the Ardh Kumbh Mela in Prayagraj in Uttar Pradesh. First Shahi Snan will be observed on the day. Makar Sankranti is an auspicious day based on the movement of the Sun (Surya). ‘Makar’ or ‘Makara’ refers to ‘Makara rashi’ – the zodiac corresponding to Capricorn. ‘Sankranti’ in Sanskrit means ‘to cross into’ or the day when sun enters from one zodiac sign to another. So Makar Sankranti is the day when the sun enters into the zodiac Capricorn. It is also known as Uttarayana Punyakalam or the entry of sun into the Northern Hemisphere. The six-month long Uttarayana begins on this day. Makar Sankranti is usually observed on January 14 or January 15. Usually the day of Hindu celebrations vary from year to year in English Calendar. Hindu calendar is based on the movement of the moon and therefore it is a lunar calendar. Hence the change in the date of various celebrations with corresponding English Calendar. But Makar Sankranti is based on solar movement and therefore it has almost a fixed date. But depending on the movement of the sun from south to north Makar Sankranti date progresses i.e., a decade ago Makar Sankranti was observed on January 12 and later on 13. Now it is on 14 or 15. In future it will be observed on January 16. 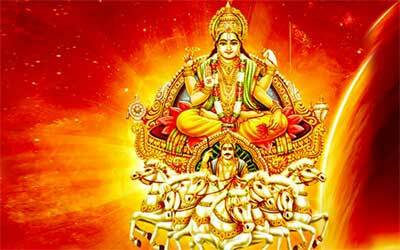 Lord Surya is worshipped on the Makar Sankranti day and is a form of Nature Worship. Every living and non-living being merges with the Brahman and Sun is the Pratyaksha-Brahman or the Brahman that can be seen. How is Makar Sankranti Observed by Hindus? A major spiritual event on the day is the bathing ritual at Sangam (confluence of Yamuna, Saraswati and Ganga) in Allahabad and also in the famous bathing ghats on River Ganga. Taking a holy dip on the day is considered to cleanse sins committed and this will lead to Moksha (Salvation). Makar Sankranti also heralds the arrival of spring. Special food made from freshly harvested grains is consumed and shared on the day. One of the most important myths is the death of Bhishma Pitamaha in the Mahabharata. Bhishma chose the Uttarayan period. (Bhisma had got a boon from his father that he will only die when he wishes.) It is believed that people who die during Uttarayana merges with the Brahman, thus ending the cycle of rebirth. Legend also has it that Lord Vishnu buried Asuras on this day beneath the Mandara Mountain. It signifies the end of evil and the dawn of righteousness. Another legend is that King Bhagiratha brought Ganga down into Patala on Makar Sankranti day. This was to get salvation to his ancestors who were cursed by Sage Kapila and turned into ashes. On this day millions of people take bath in the Ganges. Makar Sankranti is also an important bathing date during Kumbh Mela and Magh Mela. Puranas state that on Makar Sankranti day, Surya visits Lord Shani. In mythology Lord Shani, is the son of Surya. In Bengal, Makar Sankranti is noted for the Ganga Sagar Mela, Tusu Puja and Pithey parban. Bhogali Bihu and Tusu Puja are celebrated on the occasion in Assam. Makar Mela is observed in Orissa. Ghughuti or Kale Kauva in Uttarakhand. Shishur Sankraat in Jammu and Kashmir. Tila Sankranti in Mithila region. Maghi in Haryana, Punjab and Himachal Pradesh. In North India, it is the time of Lohri and Khichdi Parv. Sun rays directly falls on the murti (idol) worshipped in certain temples on Makar Sankranti day. The most famous among them is the Gavi Gangadhareshwara Temple near Bangalore in Karnataka. Dahi Chura - an food prepared from rice flakes and yoghurt - is consumed on the day in many regions. Jaggery, rice, sugarcane, sesame seeds and milk are the common food used on Sankranti in all regions. And Sesame especially helps in maintaining body heat during winter. Residents of 10 villages located on the outskirts of Manali in Himachal Pradesh do not make any kind of noise for 42 days starting from Makar Sankranti. In the 17th century, Makar Sankranti was around January 9 and in the 27th century, it will be around January 23. Importance of Makar Sankranti and the reasons for celebrating it. What to do on Makar Sankranti?